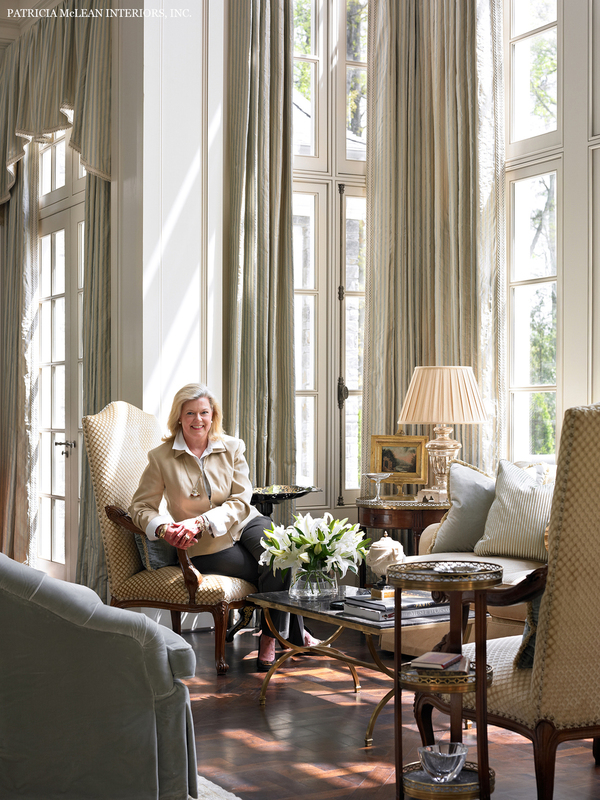 2013 Atlanta Symphony Associates' Decorators' Show House — Patricia McLean Interiors, Inc. The 2013 Show House living room is large in every dimension. The challenge began with the soaring window treatments. The architecture is French and a French silk, small-scale stripe in pale blue and cream is the perfect accent. The soft palette sets the tone for the room. All fabrics and trim are from Scalamandré in silk, velvet and silk velvet. It is magical to see the fabrics work their way around the room. The textures and tones are so rich playing off each other. Custom club chairs at the fireplace, an antique French daybed in the center, French and Italian chairs throughout and precious French stools standing at attention for guests at a period English Regency center table are luscious in the haute décor textiles. All the upholstery is adorned with pillows in custom designs with their own special shapes and trims. The fireplace is heightened with a period Louis XVI mirror and anchored by a pair of magnificent period Italian commodes replete with Greek key detailing. The antique fan in the center of the mantle is decorated on both sides with chinoiserie scenes and has its own gilded box as a stand. The Oushak rug, with its soft grays, blues, greens and golds, enhances the room (and at the time of the 2013 Show House was the largest in Atlanta). Each fabric and trim has been selected to complement its subtle hues. A pair of French chandeliers are custom-finished to complement the home's existing imported French window and door hardware. An English and an Italian gilt barometer, as well as French and Venetian prints and a French portrait of a boy, decorate the walls. 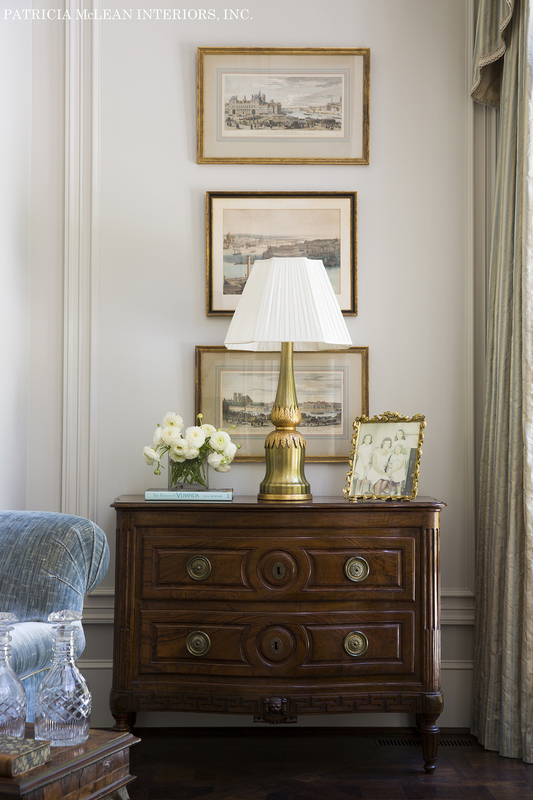 The overall feeling of "Grand and Glorious" is a chapter title in the new book, “Haute Décor,” written by Steven Stolman, president of Scalamandre. The book features this living room and captures the design beautifully. At a lecture at the Atlanta Decorative Arts Center, Mr. Stolman said to Patricia, "This soaring room, with your mixture of furniture, antiques, fabrics and window treatments, is breathtaking – you nailed it!"